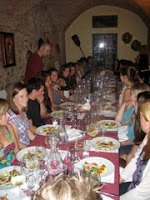 Last Thursday, Umbra students attended a wine tasting at a local enoteca in Perugia. The art of wine production came alive as the expert explained how to pair foods with the wine’s acidity, how to read the labels, and how to use one’s sense of smell, taste, and sight to examine its quality and age. Students sampled three types of wine to judge for themselves whether they found hints of green apple and almond here or honey and blackberry there.